Rose and I had this dish in Hawaii with ahi (tuna) and instantly fell in love with it. We went back to the same restaurant the next day and had it again, carefully figuring out the ingredients because we were sure we could duplicate it at home with salmon. It may be even better! With salmon you first need to pull any remaining bones out with needle-nosed pliers (a new kitchen tool in our house). After we’d had it a few times, we saw a program on TV that used a special hammer to get the fish into the right thickness. We’d used a beer bottle and saran wrap for the couple times when the cutting hadn’t gone so evenly. Now we have such a hammer (it has a very wide, flat head), and you can cut-and-bang out the thin pieces really fast. **Note from Kev in a previous email** On sashimi, we (and by that I mean I) learned the hard way that you need to freeze your fish first to kill parasite eggs. But sashimi delicately shaved from fresh-frozen salmon is exquisitely delicious with some wasabi diluted in soy sauce. We usually eat nothing but this for two or three evenings after bringing home a load of fish. – Sprinkle a light bed of balsamic vinegar on a flat-surfaced plate (but which has a raised edge). – Slice the filet flat-wise into about 1/8″ thin, flat slices. I find it easiest to do by cutting off the bottom as I hold it down on a very flat cutting board. No need to be exact, but you want it very thin. Odd-shaped pieces are likely. No problem, just lay them and piece them out onto the balsamic vinegar to make a fairly unbroken sheet of fish that covers the whole plate at approximately the same thickness. – Sprinkle balsamic vinegar, chopped onion, fresh-ground black pepper, and capers on top. We found that we like white balsamic vinegar best. – If you got a little too much vinegar on, gently pour excess off one edge of the plate. Serve still cool (or refrigerate until time to serve). It is amazingly good! It sounds sooooo delicious! Next time I’m in Alaska, I’d like you to make some for me, please. I bet we could do this with Sea Bass, too. I’m going to try it while I’m here (Roatan). Great post, Kevin and Rose!!! 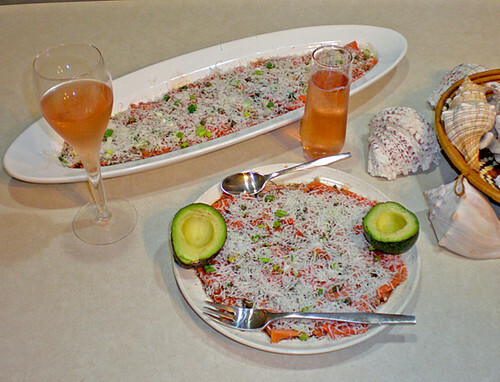 Oooh that salmon carpaccio looks delicious!! It’d be so nice to have a bit of freshness in the middle of heavy winter foods. Great adaptation! Wow, that looks so good! YUM! I make salmon all the time. I’m going to have to find a hammer like that. I often like to pound chicken and pork into cutlets and they never come out evenly. I’ll be giving this a try! Great post Kev, we made this Saturday with some salmon we bought from Pikes Market….it was soooo yummy. We didn’t have capers but topped it with some mixed greens and red onion!